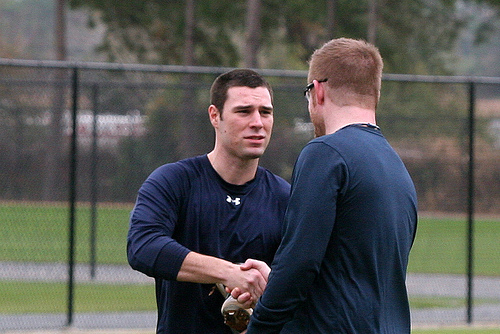 There is only one real positional battle in the Detroit Tigers camp this spring. They are apparently all set at catcher, first base, shortstop, third base, all three outfield positions and designated hitter. Even the starting rotation is pretty much engraved in stone barring injuries or implosions. The only starting job to be settled is second base. General manager Dave Dombrowski and manager Jim Leyland have both said that Carlos Guillen will be the second baseman when he recovers from micro-fracture surgery on his knee, but he is not expected to be ready at the beginning of the season. With his injury history, there is also no telling how long he can stay healthy once he gets back. So, you've got to believe that the Tigers are hoping that somebody else will seize the job both short-term and long-term. The main candidates are Scott Sizemore, Will Rhymes and Danny Worth. Sizemore was given the job last year after Placido Polanco entered free agency and signed with the Phillies. However, Sizemore broke his ankle in the Arizona Fall League and was not fully recovered for the regular season. As a result, he was never comfortable at the plate or in the field as a Tiger and ended up back in Toledo. He is now reportedly fully healthy and ready for a second chance. He is the only one of the middle infielders with power and has the best overall upside. Thus, I'll consider him a little better than even money favorite to win the starting spot. Will Rhymes took the starting job last year after Sizemore failed and Guillen was injured. He made good contact and played a steady second base down the stretch. He's a left-handed batter on a team that needs left-handed bats. The scrappy infielder is also a favorite of Leyland. However, he lacks the power of Sizemore and some believed he played over his head last year. It's impossible to root against the fan-friendly and computer-savvy Rhymes, but he does not have the potential of Sizemore. I'll say that he has a one out of three shot at claiming the open spot. Danny Worth is a better defender than either Sizemore or Rhymes and the Tigers certainly could use some defense up the middle with the steady but immoble Jhonny Peralta at shortstop. Worth is a weak hitter though and his fielding is probably not strong enough to offset his offensive shortcomings. He profiles as a utility player and is a long shot to win the starting job. If all else fails, there is always Ramon Santiago. The Tigers know what he can do - he'll play solid defense and provide passable offense. They've always regarded him as a utility player though and that's probably what he'll be again this year. Finally, I'll throw out a long long shot - Brandon Douglas. The twenty-five-year-old rookie has a lifetime minor league batting average of .331 including .359 in 35 games at double-A Erie last year. He's a decent prospect who may have a future in Detroit, but he will almost surely head to the minors again this year. So, Sizemore is the early favorite, but there is plenty of competition and this battle could go down to the final week of spring training. You know that picture is not Scott Sizemore, right? Looks like Patrick Leyland. Roger said it was Sizemore, but I thought it didn't look quite right. He usually looks like Bobby Higginson. Not sure it's Leyland either after looking at some pictures. Sorry Lee, my comment sounded kind of rude. Didn't mean it that way. This is definitely Scott.